We’re very excited to be in attendance at the Apache Lucene EuroCon in Barcelona October 17, 18, 19, and 20th, 2011. Our own Michael McIntosh, VP of Search Technologies will be presenting a talk on October 19th, Enterprise Search: FAST ESP to Lucene Solr. The good folks at Lucid Imagination are presenting the conference and will be video recording his talk for future broadcast. I mourn Steve’s passing and feel the tremendous void of his absence. At the same time I rejoice and revel in his accomplishments, his amazing impact on this world and the people around him. Steve and the people he inspired have had a tremendous direct impact on the quality of my professional life as a software engineer and tinkerer. He helped provide and inspire the creation of amazing tools that are a joy to use and work with. He helped show us what beauty can be found at the heart of even our most technologically advanced offerings if we can just imagine the possibilities. If we wish to preserve the spirit of his vision and carry his way of looking at the world and technology products forward, we should also look at the people who came before that inspired Steve himself. An individual who was a great inspiration to Steve was a man named Edwin H. Land, a scientist and inventor of instant photography as well as co-founder of the Polaroid Corporation. Edwin H. Land came about as close as the equivalent of being a rock star to the general public as any scientist has for his time. 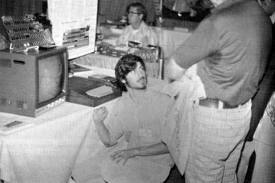 There is a great article discussing the impact Edwin Land had on Steve Jobs that is well worth a read. There is a great presentation called 12 Lessons Steve Jobs Taught Guy Kawasaki by Guy Kawasaki, a Silicon Valley venture capitalist, bestselling author, and one of the Apple employees originally responsible for marketing the Macintosh in 1984. He outlines the principles that guided Steve’s outlook in regard to business and product development that can be applied to all of our efforts. If we wish to preserve Steve Jobs’ spirit and way of thinking in our world despite his absence, we would do well to look closely at his life, those who inspired him and the people he inspired and surrounded himself with. No innovator succeeds purely on their own, and while Steve Jobs is no exception, his vision, tenacity and leadership clearly has had broad and long reaching impact on our world. Thank you for your contributions to our world Steve, you will be greatly missed. On October 5, 2011 at age 56, Steve Jobs passed away peacefully surrounded by his family. He had been battling a rare form of pancreatic cancer for 7 years. 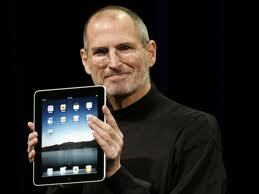 Steve Jobs with revolutionary tablet computer, the iPad. “We are deeply saddened to announce that Steve Jobs passed away today. Steve’s brilliance, passion, and energy were the source of countless innovations that enrich and improve all of our lives. The world is immeasurably better because of Steve. In 1976, our CEO Rich Roth was a novice engineer and member of the (in)famous Homebrew Club. deliver them to the other computer stores in the Bay area. HADLEY, MA–July 18, 2011—TNR Global is pleased to welcome Chris Miles in the role of Senior Software Engineer on TNR’s Search Team. Miles will be responsible for designing and implementing custom enterprise search software for TNR’s clients. Among other projects, Chris will also develop solutions for one of TNR’s largest clients, a publisher of manufacturing parts and vendors. He is proficient in software languages Java, C++, C, Ruby, PHP, and CSS. Prior to joining TNR Global, Miles was a Senior Systems Analyst at Cooley Dickinson Hospital. He has held consulting roles for CarePaths Inc., and was a Senior Developer for Miller Samuel Inc.
“We’re excited about the addition of Chris to TNR. He brings a wealth software development expertise to our team” said Michael McIntosh, VP of Search Technologies of TNR Global, LLC. Join us as we extend Chris a warm welcome to the TNR team! The Resilient Business Summit, held on November 13, 2010, was spear-headed by Rich Roth, CEO of TNR Global. Hidden Tech and TNR Global co-sponsored the summit. Small business owners attended the summit and participate din pro-active dialogue on topics ranging from economic stability, current and future policies, best practices, and program support, all based around the theme of creating and sustaining Resilient Small Businesses. TNR Global is co-organizing and sponsoring CloudCamp Western Massachusetts that will take place on April 20, 2010, 2:30pm-7pm, at the National Science Foundation funded National Center for Information and Communications Technologies (ICT Center) at Springfield Technical Community College (1 Federal St, ICT Center, STCC, Springfield, MA 01105). This event is co-organized by CloudCamp co-founder Dave Nielsen and the ICT Center.